Contrary to popular opinion, faxing is still relevant in this digital age. Despite the proliferation of social media usage and emailing, faxing provides us with the option to communicate with someone immediately, and at the same time, our mode of communication, which is the faxed document, is a tangible document that may be replicated by the receiver for documentation and record-keeping purposes. Other than that, faxing also allows us to add a personalized touch to our business dealings. There are several ways in which faxing makes things more convenient. One of the persons who can benefit from faxing are job applicants. Job applicants can also send their resumes and cover letters through faxing. If you are currently thinking of sending your resume through fax, then you need not worry about your cover letters. Cover letters that are faxed are also known as cover sheets. To know more about cover sheets, download our collection of Fax Cover Sheet Samples, which are available in PDF and Word formats. Scroll down below to view these templates! Cover Sheets for Resume: What Are These? Cover sheets for resume are the faxed version of regular cover letters. Faxing is indeed an unorthodox method of sending one’s resume to a company or prospective employer. That is why, if you plan on sending a resume through fax, you need to be able to know the proper procedure in sending one. 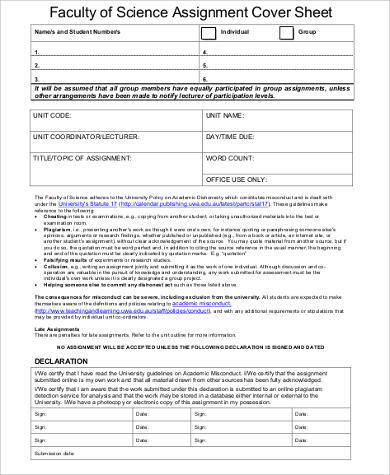 You may opt to have your cover sheet in a fill-out cover sheet format or in a formal letter format. 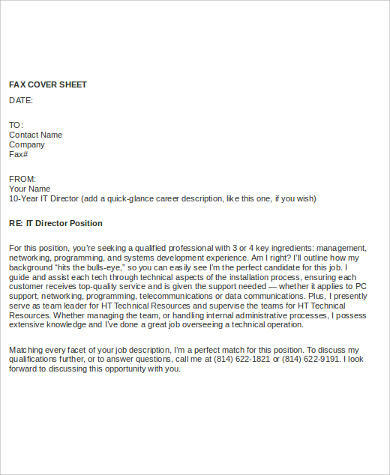 Whatever format you’ve chosen, you need to indicate at the topmost part that the fax you are sending is a cover sheet with resume. If you have chosen the formal letter format, observe standard formats of professional letters by addressing your recipient with the use of formal salutations. Include in your letter’s body only those qualifications that are most important. You should also remember to give your contact number or email address so that the hiring manager would find it easy to contact you should they decide to give you an initial interview. Remember to close your letter formally. For more cover sheet reference, check out our collection of Cover Sheet Examples. Simply click on the link provided. Since you are faxing a document, assume that your recipient is using standard-sized paper thus only use standard letter fonts, and the font size of your cover sheet should be 12. Remember to indicate how much you want to add value to the company that you are applying for. Be concise and avoid flowery words. Don’t exceed one page for your cover sheet. 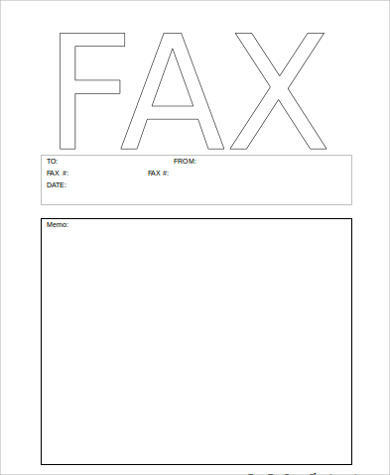 Speaking of cover sheets for faxed resumes, we also have another collection of Blank Fax Cover Sheet Samples that would be perfect for you should you want to forego the arduous process of creating your own cover sheet. These templates are easily downloadable and ready for you to use immediately! Simply download any of the templates that you prefer and then you may fill out your personal information and other pertinent resume details!